ATHENS (Reuters) - The Greek parliament began debating a no-confidence motion in the government on Thursday, with opposition lawmakers furious over Prime Minister Alexis Tsipras's deal aimed at solving a decades-old dispute with neighbouring Macedonia over its name. Tsipras and Macedonian Prime Minister Zoran Zaev reached a landmark agreement on Tuesday to call the ex-Yugoslav republic the "Republic of North Macedonia", settling nearly three decades of wrangling over its name and removing an obstacle to Skopje's bid to join the European Union and NATO. But in a reflection of the depth of feeling over the issue, both Zaev and Tsipras were accused in their home countries of "national capitulation". The issue has triggered mass protests both in Skopje and Athens in previous months. He is trailing in opinion polls, hurt by the economic reforms introduced as a condition for a third multibillion-euro bailout for Greece in 2015. "This is a damaging agreement to our national interests," the motion said. "It is a major national concession which cannot be tolerated." Tsipras's governing left-right coalition has 154 seats in the 300-member parliament, so the government is unlikely to fall. 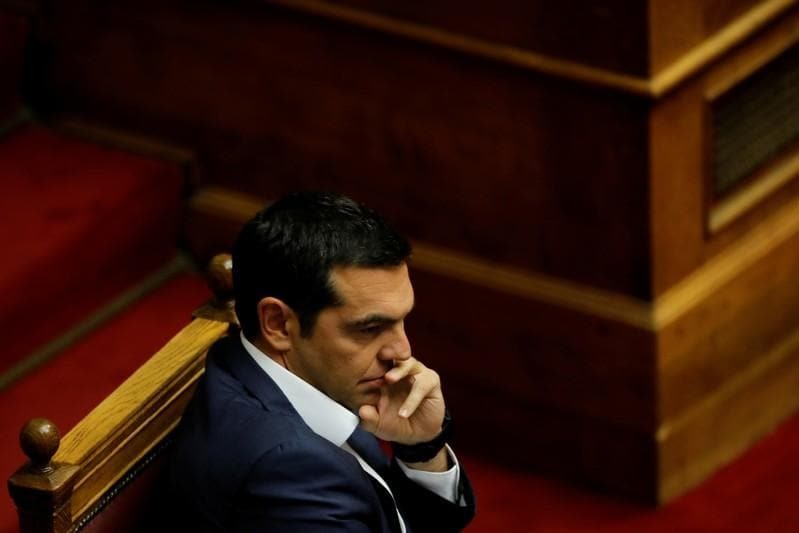 If parliament were to back the no confidence motion Tsipras would have to hand over his mandate to the country's president. His coalition ally, the Independent Greeks, have said publicly they would not support the accord reached with Skopje but would not topple the government, either. The debate was expected to wrap up on Saturday. Protests were scheduled outside parliament on Saturday night, although demonstrations in central Athens were also expected on Friday. Under the deal, Macedonia would become formally known as "the Republic of North Macedonia". It is currently known officially at the United Nations as the 'Former Yugoslav Republic of Macedonia'. "I am compelled, it is my duty, to exhaust every possibility offered in the constitution to avert this development," New Democracy leader Kyriakos Mitsotakis said. "What goes around comes around," Tsipras said. Athens has long objected to its northern neighbour's use of the name 'Macedonia', saying it implies territorial claims on a northern Greek province of the same name and amounts to the appropriation of Greece's ancient cultural heritage.